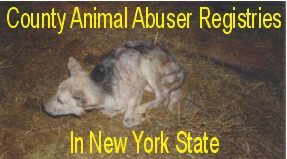 New York counties are beginning to create and post online animal abuser registries. NYSHA is providing links to those counties that currently maintain an online registry of persons convicted of animal abuse in their county. NYSHA will add links to other counties as they pass laws to set up registries and post them online. Counties specify that anyone selling, giving away or adopting an animal to another person must check the counties’ Animal Abuse Registry prior to any change in ownership. Giving, selling or adopting an animal to a person on the Animal Abuse Registry is a violation of county law.